Situated at the heart of Salt Lake City, Utah, Temple Square is the spiritual, cultural and administrative center of the Mormon faith. This ten acres plot of land includes a Temple, a domed tabernacle and numerous buildings, monuments and memorials. 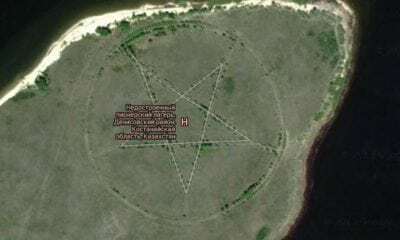 While this place may seem holy and wholesome, a closer look at the structures reveal the presence of occult, pagan and masonic symbols. A deeper study of those grounds only adds to the controversy regarding Mormonism and reveals the disturbing truth about its real god. 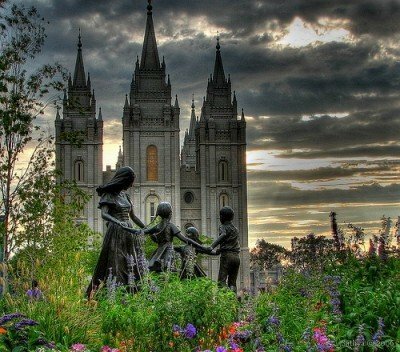 This article’s intent is not to condemn Mormonism as a faith, but rather to analyze the symbols in Temple Square in an objective matter. A visitor of this religious area finds himself surrounded with symbols esoterically associated with Black Magic, evil or ancient paganism. 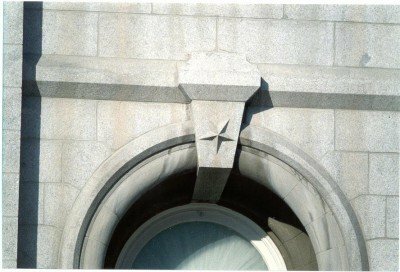 Why are these symbols visible on supposedly Christian buildings, of all places? Many ex-Mormons have claimed that the LDS secretly leads followers to the worship of Lucifer. Are they right? The Temple is the centerpiece of Temple Square and acts as the heart of the Church of Jesus Christ of Latter-day Saints. The building itself is stern and imposing and surrounded with many sculptures. It is said to accomplish the same functions as the ancient Temple of Jerusalem. While we can write pages on how this is not true, we’ll focus on the structure itself. The exterior of the Temple contains numerous symbols which are not simply remnants of ancient paganism but directly associated with evil. The most blatant symbol is the inverted pentagram. 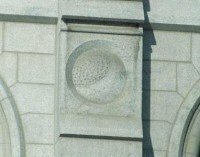 This symbol is found all around Temple Square, in multiple forms. An upright pentagram stands for the five elements, protection against malignant spirits and is an embodiment of the Golden Proportion. It also signifies the dominance of the divine spirit on the lower nature of Man. Conversely, an upside down pentagram represents the submission of the spirit to matter and the submission of man to his lowest impulses. Eliphas Levi’s rendering of the upright and inverted pentagram. Contrarily to popular belief, Levi did not come up with the use of the inverted pentagram as a negative symbol. It was used in ritual magick centuries before the publication of his work. The walls of the Temple bear Sun stones, phases of the moon and stars (in the form of inverted pentagrams). Those three celestial bodies can be found in ancient pagan temples and their use can be traced back to the times of Baal Worship. 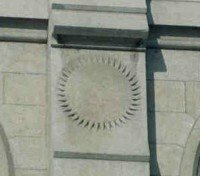 Through Mystery Religion, occult orders like the Freemasons have preserved those symbols and still apply them on their own monuments. 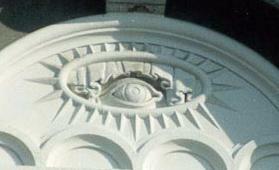 This classic masonic symbol representing the “Great Architect” is right on the facade of the Temple. It is surrounded by glory and a veil. It most probably represents the initiatic process of the Mormon Church, which is very similar to the one Freemasons go through. On top of the handshake is the saying “I am Alpha and Omega”, which is taken from the Book of Revelation. It can be translated as “I am the beginning and the end”. The fact that it is placed on top of the handshake, the symbol representing LDS’s secret doctrine, makes me wonder who is the Alpha and Omega. Each Mormon Temple has its own baptismal font, mounted on the backs of twelve life-size oxen. Mormons say it is modeled after the “laver” which was situated at the entrance of Solomon’s Temple. The only thing they’ve forgotten to mention is that the laver was used by priests to clean themselves after animal sacrifices (laver means “to clean”). It was not used to baptize people. It was certainly not used for the “baptism of the dead”, a Mormon practice where deceased people become posthumously part of the Mormon church. Numerous scandalous baptisms have taken place where, for example, holocaust victims were baptized without the family’s consent. More recently, Barak Obama’s mother, who died of cancer has been baptized by the Mormons without consent. There is no trace of this disturbing practice in ancient Christianity or Judaism. 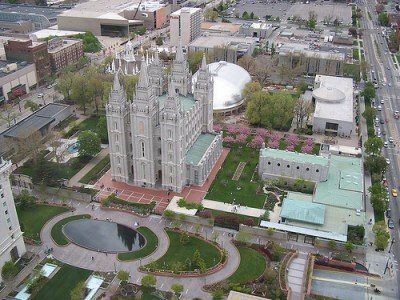 Ex-Mormons who have witnessed these ceremonies say the rituals dwell in the fields of witchcraft and spirit invocation. 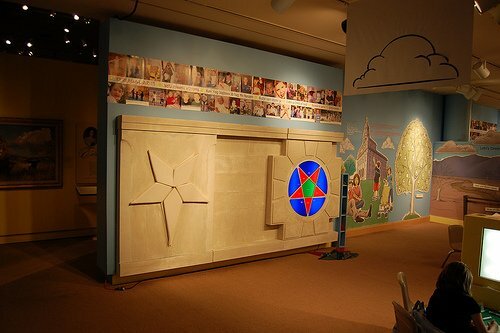 This museum displays exhibits celebrating the Church of Jesus Christ of Latter-day Saints and its history. You can find information about their migration, settlements, and the men who have served as prophets and presidents from 1830 to the present. There is also a special kid’s corner. 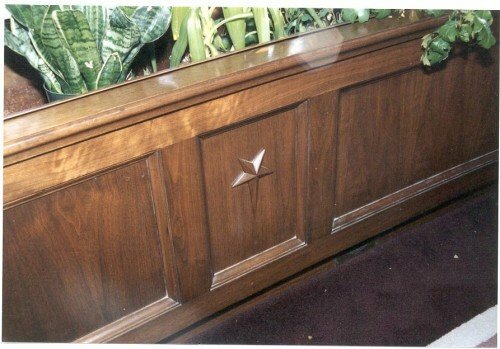 What better place to display…inverted pentagrams? These two pentagrams appear at the entrance of the Museum of Church History and Art. Once again, it is important to stress the significance of this symbol as it is the equivalent of placing an upside-down cross right on a church. The circled pentagram on the left is particularly significant due to the fact that it is used in Black Magick rituals. 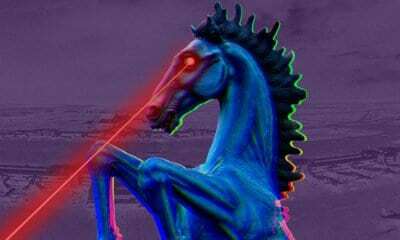 merely takes the emblematic figures of white magic, and by inverting and reversing them signifies that it is left-handed. We can find more pentagrams in the museum in…the kid’s corner. The Visitor’s Center is a tourist favorite but contains the most disturbing symbolism of Temple Square. It basically reveals the real object of worship of Mormonism. The Christus Statue is said to be the icon of the LDS Church and is dramatically displayed in the Visitor’s Center. 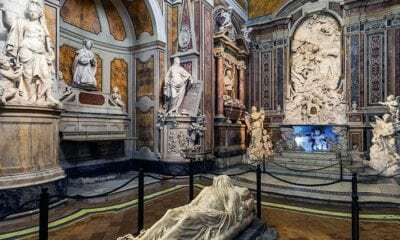 It is a replica of Bertel Thorvaldsen’s Christus in Copenhagen, Denmark. The Mormon version is placed in front of an unusual setting: the universe. This might refer to the Gnostic concept of “cosmic Christ”. One detail is however striking and unusual. You might know that one of the most basic ways to analyze a work of art is through the relation between light and shadow. Well in this setting, the Christus figure is actually casting a shadow on planet Earth. Isn’t Jesus considered the “Light of World”? Casting a shadow on something symbolically means that is it keeping it in darkness and ignorance. If this figure of Jesus isn’t the source of light, what is then? The answer lies within the rotunda of the Visitor’s Center. The rotunda faces the Christus statue and bears a special kind of inverted pentagram. The bottom point of the pentagram is elongated. 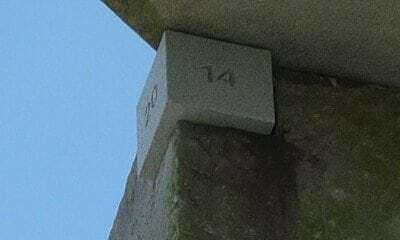 This detail which goes unnoticed by most visitors carries heavy occult meaning. First, the irregular length of the bottom point represents a perversion of the power of Good. 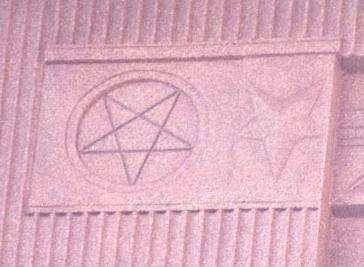 Second, this particular pentagram, with the bottom point falling down carries a precise esoteric meaning: the fall of Lucifer, the Fallen Angel, the Morning Star. After establishing this fact, the light and shadow riddle can easily be solved. Lucifer, the light bearer, is considered the source of light of the universe. The figure representing Jesus Christ blocks the source of light on Earth and thus meaning that Christianity has an obscuring effect on mankind. So this setup, who apparently celebrates the coming of Christ on Earth represents in actuality the exact opposite. Throughout history, all spiritual currents have regarded light as being the ultimate representation of good, truth, beauty, knowledge and divine wisdom. In all religious art, the source of light is of an utmost importance. 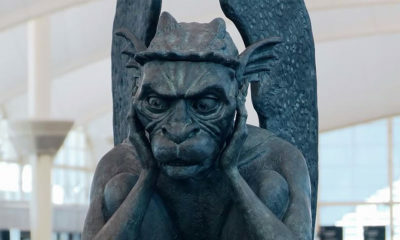 Some ex-Mormons have claimed that the LDS worships Lucifer in subtle yet deceitful ways. The symbolism in place sure does corroborate their testimonies. 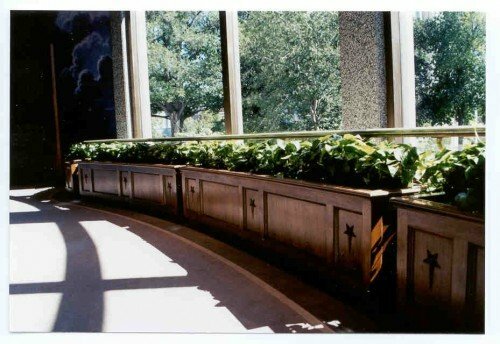 Another strange feature of the Visitor’s Center is the above arrangement: Adam and Eve kneeling in front of an altar which has fruit on it. This is a reference to Genesis IV, which describes the offerings of Cain and Able to God. “1. And Adam knew Eve his wife; and she conceived, and bare Cain, and said, I have gotten a man from the Lord. 4 And Abel, he also brought of the firstlings of his flock and of the fat thereof. And the Lord had respect unto Abel and to his offering. 7 If thou doest well, shalt thou not be accepted: and if thou doest not well, sin lieth at the door: and unto thee shall be his desire, and thou shalt rule over him. To sum up the story, Cain and Abel were the sons of Adam and Eve. Abel was in charge of sheep, while Cain took care of the ground. When it was time to give offerings to God, Abel slew a lamb in sacrifice while Cain gave fruit. God accepted Abel’s gift but rejected Cain’s fruit (the reason for this is unclear). Cain then lost his tempter and ultimately killed his brother. 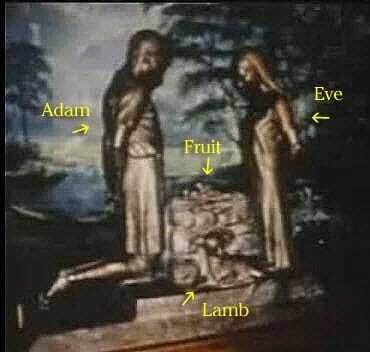 The sculpture displayed at the LDS church portrays Adam and Eve offering fruit to God while a lamb (Abel’s gift) sits there alive and enjoying its non-sacrificed state. One can’t help but wonder: what does this piece represent if not a sense of resentment (maybe even defiance) towards a cruel and unjust god? Why do we portray Cain’s offering which was rejected by God? The meaning of this arrangement falls right into the beliefs of Luciferians, who see God as a stubborn tyrant. Biblical and mythological figures who defy God are celebrated by the Luciferian doctrine (see the article on the Rockefeller Center). Lucifer, the light-bearer is considered to be the hidden savior of humanity who brought the gift of godliness to humans. 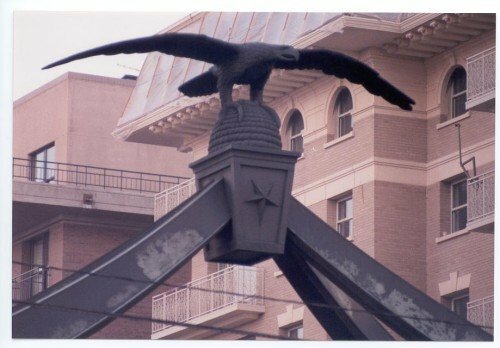 Situated at the corner of State St. and South Temple, the Eagle gate is yet another occurrence of an inverted pentagram. We can find on top of it a huge 200-pound eagle clawing a beehive, the symbol of Utah, of Mormonism and coincidentally an important symbol of Freemasonry. 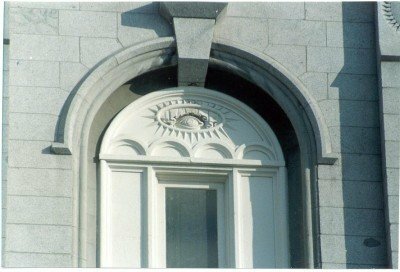 This article barely scratches the surface on the occult symbols found at Temple Square. There are numerous esoteric concepts that can be studied such as reflective pools (who embody the notion of “As Above so Below”), phallic and yonic symbols, astronomical references to Saturn and many more. Without even having previous knowledge of the history, philosophy or beliefs of the LDS, a symbol-literate person can grasp the core intent of this church by reading the meaning of their art. 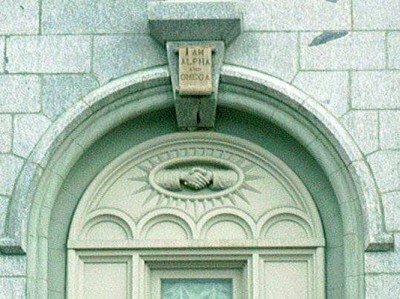 The rituals, symbols, and modus-operandi of the LDS are directly lifted from Scottish Rite Masonry. 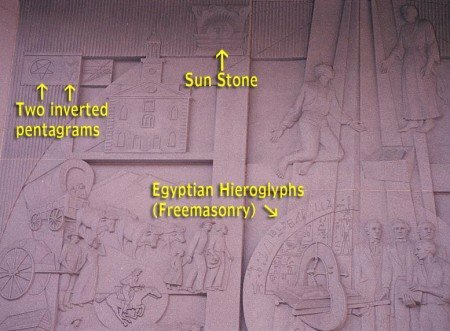 The hidden meaning of the art at Temple Square incorporates a mix of pagan and subversive symbolism and subtly celebrates the worship of Lucifer. 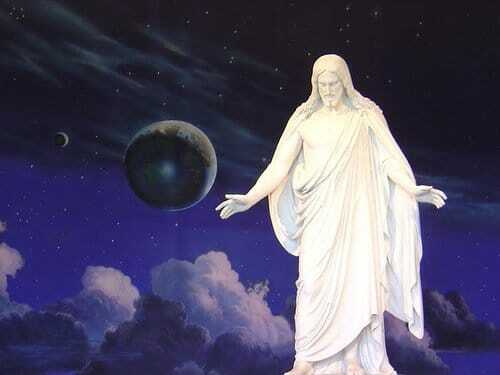 I do not claim to be a specialist of Mormonism or of Joseph Smith Jr., the Mormon prophet. 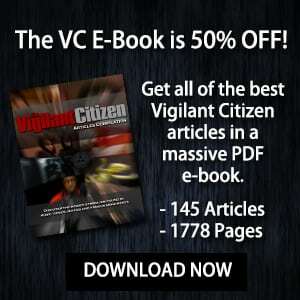 I’ve tried to stay as unbiased as possible in the research and composition of this article. I, however, know that the scriptures warn the world against false prophets and, from what I’ve gathered, Joseph Smith is as false as it gets. I hate to be the one to say it, but someone has to. 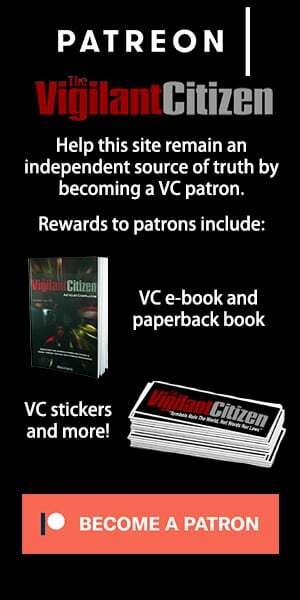 Stay vigilant. 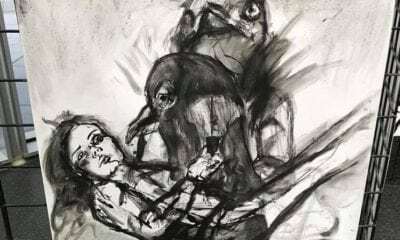 Why Are There Paintings Depicting Ritual Abuse On Display at the Las Vegas Courthouse?